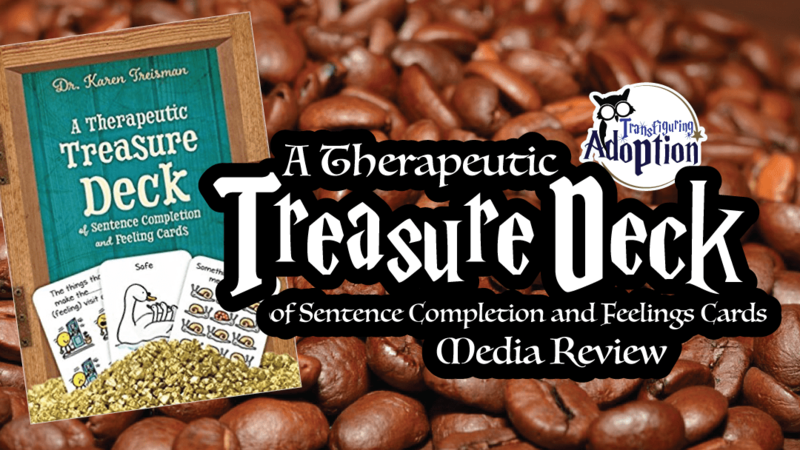 ” The perfect tool to add to any “therapeutic treasure box,” this set of 68 cards provides a way to help open conversations and structure discussions with children and adolescents aged 6+. These cards seems to be created for use with children who are working through a traumatic issue. However, there is nothing that notably directs these cards directly to foster or adoptive children. The whole activity and card set as the description states seems to be aimed at children age six or older. While these cards contain illustrative cards that are cartoonish in nature, they seem to work very well for teenagers. 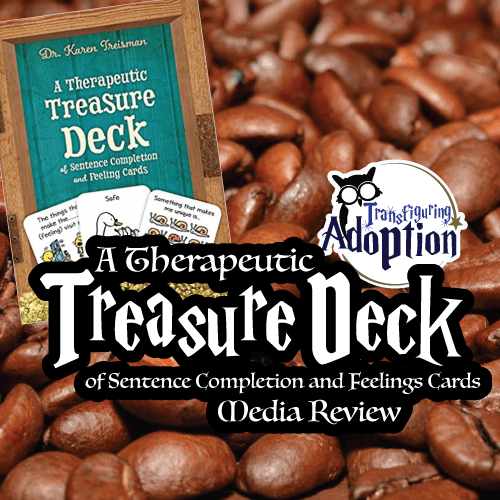 Foster or adoptive families as well as teachers, counselors or foster care professionals would be interested in the function of this card set as it strives to create an atmosphere where children can learn better how to articulate/advocate for themselves. Physically the deck as a whole seems to be very durable. The box itself is very thick and sturdy. The cards seem to be made of a heavier and glossy paper weight. We feel this is important to mention as children who have been through trauma stereotypically tend to not treat items with as delicate of a touch as other children. The deck does include an instruction guide. This manual really seems to give an explanation of the various types of cards in the deck and simply gives suggestions on how one might incorporate these cards into a home or counseling session. The manual does appear to encourage people to draw upon their own creativity for using this tool. The two types of cards in this deck as mentioned in the description above are, “feelings cards” and the “sentence-completion cards.” They are pretty self-explanatory. The feelings cards help a child to see various feelings or emotions. Along with the name of the emotion on each card is a descriptive picture which all seem to do a fantastic job of illustrating the emotion on the card. Some of the feelings used in this deck include: helpless/hopeless, trapped, energetic, scared/fearful, lonely, proud, frustrated, safe, and so on. The sentence-completion cards give a variety of different discussion or open ended thoughts ranging from simple thoughts to more reflective/contemplative thoughts. Some examples of the card prompts are: “When I feel unsafe I…,” “If I could be someone else for the day, I would be…,” My favorite colour is…,” “If I could go back in time to a moment, I would go back to…,” and so on. Overall, this tool appears to be very beneficial for your family. These cards will not only give caregivers ideas of topics to discuss with their kids but they will also provide children with the necessary vocabulary they require to communicate their needs with their caregivers. It would be beneficial for families to have these cards lying around on the dining table or a high traffic area where every member of the family is able to see them throughout the day. 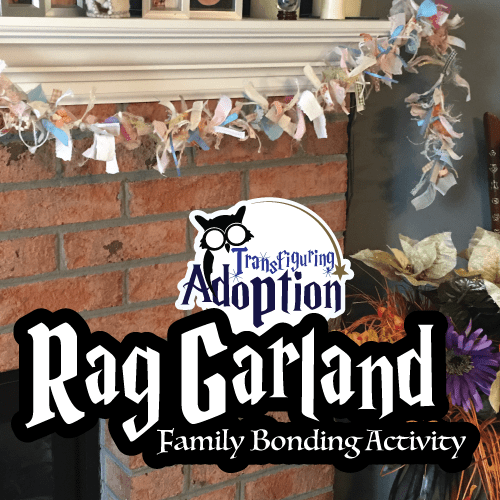 Transfiguring Adoption believes that this tool will be highly beneficial to the health of your foster or adoptive family. Fidget spinners have become the desire of kids of all ages across the United States, inundating checkout lanes and mall kiosks. Having started as a simple contraption, they are now being sold in light-up and singing versions and come in all shapes and sizes. Before the beginning of the current fidget spinner craze and the smaller trend of fidget cubes which preceded it, the term “fidget” as a noun was not well known outside of circles of therapists and parents of children with special needs. As a matter of fact, just months ago our volunteers discussed holding a fidget drive to collect fidgets to give to foster and adoptive families, but they struggled with how to express succinctly what they would be collecting. 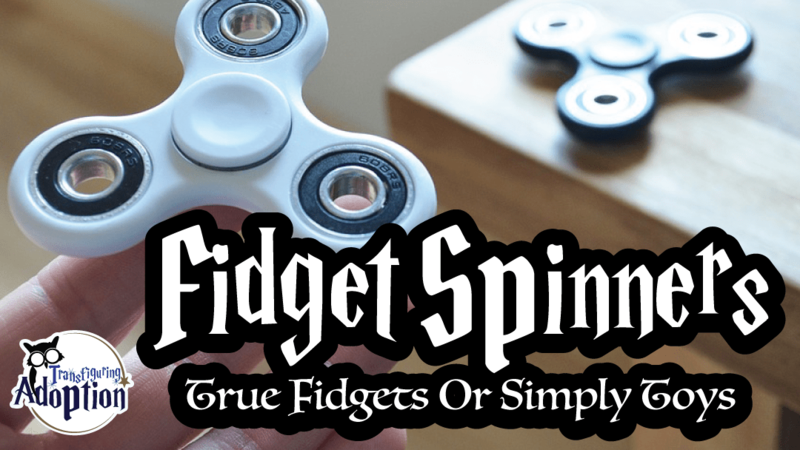 The fidget spinner and fidget cube have both also normalized the use of fidgets somewhat, making children who need these tools feel less odd for using something their classmates do not. So What Is a Fidget Exactly and Who Do They Help? To fidget, as defined by Dictionary.com, means to move about restlessly, nervously, or impatiently. Fidgeting is very common among children with ADD/ADHD (attention deficit disorder and attention deficit hyperactivity disorder), autism, anxiety, mood regulation disorders, and trauma. Children who are in foster care, who have been adopted, or who have special needs often lack the ability to calm, or self-soothe, themselves, and it’s our job as their life coaches to teach them these skills and also to come alongside and calm them until they learn to do it themselves. Kids with any of the aforementioned difficulties need sensory activities to help them calm down. Engaging the senses and providing motor activities in different ways produces calming effects, reducing stress and anxiety and helping the brain and senses organize themselves and increasing attention. Fidgets are objects that provide sensory input and motor activity that produce calming effects for their users, they increase attention, and they allow users to better filter sensory input. Are Fidget Spinners True Fidgets? In our travels, we have encountered teacher after teacher who loathes fidget spinners. These fidgets have sparked controversy and begun to be banned in schools several states. Good fidgets provide a sensory experience for their users without distracting them or others around them. Fidget spinners are visually distracting to those using them and to others who can see them. One teacher talked about children who do not need fidgets playing with them in her classroom and about students spinning them on their nose. Additionally, fidget spinners do not provide much gross motor engagement or tactile stimulation. 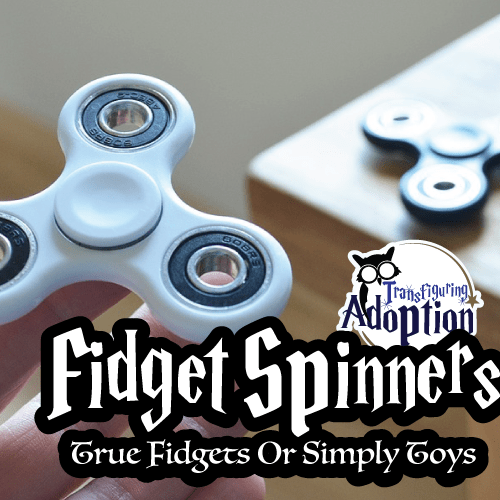 While research has not been done to test out this new fad, the general consensus among scientists, therapists, teachers, and parents seems to be that fidget spinners are toys and NOT true fidgets. Every child is different, so we recommend you experiment with what types of motor activities and sensory experiences help your child to be calm and attentive. Check out our blogs—”The Best Fidgets for Surviving Amusement Parks with Kids” and “Calm Down Boxes for Foster, Adoptive and Special Needs Homes“—for ideas! I’ll be the first to admit that I hate doing crafts with kids. Our house is full of people and gets cluttered quickly. I find myself struggling to find places for all the crafts kids do. Last month, however, I was inspired to do a craft by something I saw at the store. There was this cute but pricey string of garland for Valentine’s Day made up of ribbon and fabric pieces. “I have everything needed to make that at home for free!” I told Darren, and inspiration struck. We have a quarter of a Christmas tree that got put up in our home’s entryway this past holiday season. It’s a new tradition as we had a pretty, new themed tree for our living room, and the kids wanted a tree of their own to decorate, hence the little corner entryway tree made up of the nicest pieces of our old tree. Partially out of laziness, we decided that tree would stay up year round, and the kids could decorate it for all the holidays, including making garland for each holiday out of fabric and ribbon. Cut a piece of thin twine (or yarn) to the desired length of garland you’re wishing to make. The fabric and ribbon is measured and cut (or torn) into strips and then tied onto a long piece of twine, so young ones can practice motor skills (aka occupational therapy). They can also practice patterns. For example, on our Valentine’s garlands, we would use two different pinks, a red, and then a white. And looks good even if pieces are cut unevenly or tied on haphazardly. AKA-you can’t mess it up. There’s a large margin of error. This also makes the kids feel accomplished and proud! So many kids’ crafts lack purpose, which is fine when you have one kid who does an occasional craft, but with multiple kids who love to craft, it gets hard to manage! 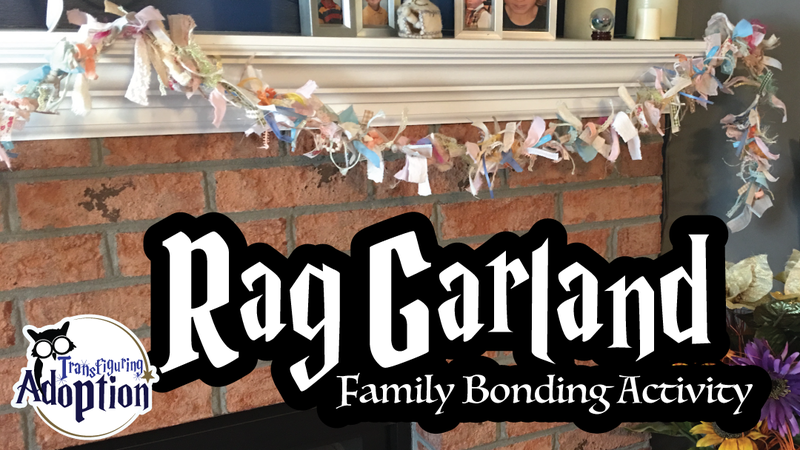 We made several strands of garland for Valentine’s Day: one about 10 feet long for our corner tree, two 8-foot long strands—one for a big window and one for our mantle, and several 5-foot strands for draping over standard windows and doors. Now we have spring-y ones throughout the house. This garland has been a really INEXPENSIVE craft. For the most part, I’ve been able to use scraps of ribbon and fabric we had around the house. I spent just a little on clearance ribbon to have enough. Since this craft is fairly easy but takes a while, it provides great time to sit around and bond and connect as a family, allowing for conversation, fun, and creativity. We are excited about this new little tradition. The kids love showing off their tree to visitors, and we are hoping as we are now licensed to do respite for other foster families, our new young visitors can join in the fun and see what they’ve added on return visits. What are your favorite crafts to do with your kids? Share your ideas!